According to scientific studies, chicken soup does in fact have medicinal value, which means that technically, according to the FDA Guidelines, it should be classified as a drug, and you should have to get prescription for it. In 2000,Dr. Stephen Rennard of the University of Nebraska Medical Center in Omaha conducted laboratory tests to determine why chicken soup might help colds, beginning with his wife’s homemade recipe, handed down by her Lithuanian grandmother. Using blood samples from volunteers, he showed that the soup inhibited the movement of neutrophils, the most common type of white blood cell that defends against infection. 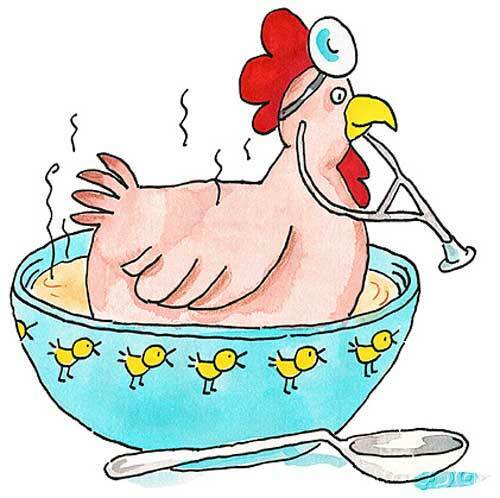 Dr. Rennard theorizes that by inhibiting the migration of these infection-fighting cells in the body, chicken soup essentially helps reduce upper respiratory cold symptoms. The researchers couldn’t identify the exact ingredient or ingredients in the soup that made it effective against colds but say it may be the combination of vegetables and chicken that work together. The tested soup contained chicken, onions, sweet potatoes, parsnips, turnips, carrots, celery stems, parsley, salt and pepper. The researchers also compared commercial soups and found many of them also had a similar inhibitory effect. 2. Peel onions and leave whole. Push 2 cloves into each onion and add to pot. 3. Put in the pot the remaining ingredients and just bring to a boil. 4. Immediately reduce heat to low, cover and simmer on the stove for 4-6 hours until the skin has melted off the meat and it is in a liquid fat form floating on the top of the soup. While cooking, It should be steaming but not excessively boiling. You don't want to heat the soup too high because a hard boil kills the natural enzymes in the raw ingredients which also give make it easier to digest providing more nutritional benefit, and give it a much more full-flavored home-made taste. Commercial soups are pasteurized at temperatures that kill enzymes and usually contain contain the neurotoxin and potential allergen, MSG (monosodium glutamate), along with other additives and preservatives that are not good for you. 5. Pour the soup through a strainer and chill 1-2 hours until fat forms a layer on the top. Skim off fat and enjoy! This is the sort of soup that can started at the beginning of a work day in a crock pot. The chicken meat can be picked off the bones and added back into the soup or used in chicken salad or stir fry, if you wish! Soup variations: If you wish you can add noodles, vegetables, and/or rice to the soup. Lemon juice and an egg beaten into it, along with cooked rice turn it into Chicken Lemon Rice soup. This makes a great base for many other soups, including tomato soup (we add tomatoes, celery, carrots, spices (such as thyme, basil and rosemary - and then puree in blender or food mill when vegetables done cooking). You can also make a much larger batch of the chicken soup and freeze it for future meals and health emergencies! It will keep for a year or more in a sealed container.